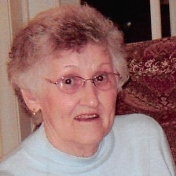 Florence A. Schoeppner, 91, of Zanesville died at 7:31 A.M. Monday, August 20, 2018 at the Genesis Hospital. She was born on Thursday, February 10, 1927 in Dexter City, Ohio the daughter of Charles and Anna Zwick Noll. Florence had previously been employed at Buckeye Carpet, 5-B's, and Old Towne Cleaners as a seamstress. She enjoyed sewing, quilting, and playing cards. She is survived by her children, Diane (Ron) Schoeppner, Beverly (Richard) Annibaldi, and Kenneth (Marcia) Schoeppner; Grandchildren, Brian (Susan) Annibaldi, Matthew (Elizabeth) Annibaldi, Wendy (Michael) Schoeppner, Bonnie (Andrew) Tenbarge, and Amy (Douglas) Schoeppner; eight great grandchildren; two brothers, Lawrence (Ruth) Noll and Raymond (Janet) Noll; and several nieces and nephews. In addition to her parents Florence was preceded in death by her husband, Alfred Schoeppner; five sisters, Marie Hohman, Ida Spence, Emma Meola Bogard, Angie Caldwell, and Eleanor Schaub; and a brother John Noll. Friends may call from 4:00-7:00 P.M. with a Wake Service at 6:45 P.M. on Thursday, August 23, 2018 at the Bryan and Hardwick Funeral Home. Mass of Christian Burial will be held at 10:30 A.M. on Friday, August 24, 2018 at St. Nicholas Catholic Church with Father Martin Ralko officiating. Burial will conclude at the Mt. Olive Cemetery. Memorial contributions can be made to St. Nicholas Catholic Church. The Bryan & Hardwick Funeral Home, 2318 Maple Ave. Zanesville is in charge of the arrangements. To share memories and condolences with Florence’s family please click on the Guest Book link on this page.